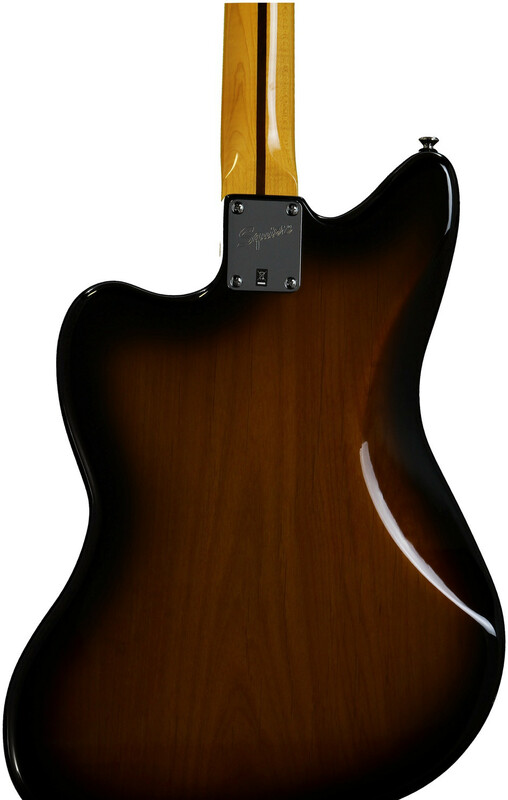 The Awesome Right Honorable Squier by Fender Jazzmaster Vintage Modified Special Review! Over the years, I’ve enjoyed the basic quality and variety of the Fender Squier brand’s offerings. They’re generally well made, generally sound great for the cash, and are always coming up with something interesting. The Vintage Modified Squier series has a breathtakingly broad set of guitars and basses that are actually lots of fun to play and VERY affordable for beginners and pros alike. I love my Fender USA instruments more than I can say: and I really enjoy kicking back with my Asian-made Squier instruments, too. The subject of this review, the Squier Vintage Modified Jazzmaster Special, is a superb instrument with surprisingly big sound and nice build qualities. I found it to be a real bargain; and it is truly well worth the money, and more. Honestly, when I unboxed my brand new Squier Jazzmaster Special, I was really very pleased with the feel, the sound, and the quality. For the price, you get a real bluesy and rockin’ guitar with Seymour Duncan-designed Jazzmaster single coils and a nice easy-to-play neck. I didn’t find much, if anything, that I didn’t like right from the beginning. It’s a blast to play, a scream to play the blues or rock through a big ol’ tube amp, and a joy on the shoulder. Overall, I like it! Buy it! You’ll be glad you did! 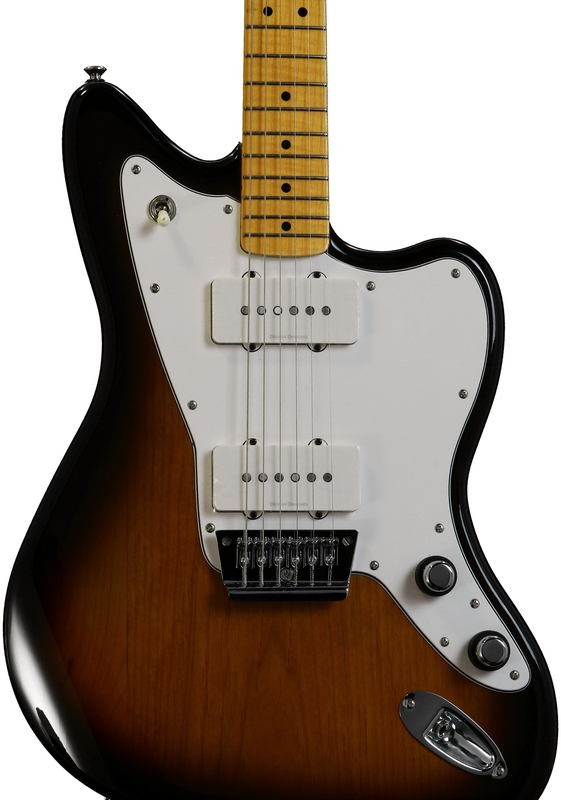 There are customer reviews and more specs for the Squier Vintage Modified Jazzmaster offset body guitar with Rosewood fretboard available here at zZounds. This guitar (as of this writing) comes in two colors: butterscotch goodness like an old 50s or 40s Tele, and that tried-and-true brown sunburst – both with a maple neck/maple fretboard. The Fender Squier Vintage Modified Jazzmaster Special is an easy-to-play instrument. For beginners, it feels like a stop-tail Stratocaster in many ways, from the feel of the neck to the way the body smoothly cradles the picking arm and the ribcage. Its offset design is reminiscent of a Firebird and a Stratocaster combined – but with out the edginess feeling of a Firebird. Overall, the guitar is easy to play, and is a pleasure to hold. Mix thoroughly, put in a dash of Jazzmaster pickups, and you’ve got this unique and very satisfying Jazzmaster Special. This particular Jazzmaster lacks the array of fiddly switches found on its more expensive cousins. Although the lack of these switches does limit the sound shaping of this Jazzmaster Special, it does make it simpler and easier for the beginner or everyday player. Besides, it is a “special” after all. Sound is a VERY strong suit for the Fender Squier Vintage Modified Jazzmaster Special. The Asian-made Duncan Designed pickups really do sound awesome. They aren’t quite par with Fender USA Jazzmasters or Seymour Duncan USA Jazzmasters, but they are darn good. At this price range (Less than $299 US, street), one wouldn’t expect pickups to be hugely wonderful – and yet they are. I like the sound of my Jazzmaster. The simple front-to-back three-way toggle switch feels and sounds solid, the volume controls are smooth and do an OK job (as with most guitars in this price range, the volume drops off with a huge curve with very little turning of the knob – the pots are “you get what you pay for” in this price range). Tone knob wise, these guitars have that old vintage-y clickety concentric tone thing going on. You spin the tone ring (the black ring under the chrome dome volume knob) and it clicks audibly and forcefully as you turn the tone up and down. If you were to close your eyes and hear this guitar played by a great guitar player through a great tube amp, you’d have a serious amount of trouble telling that this is a sub-$300US guitar. It sounds great for its price range – and even for above its price range. When compared to a US-made Jazzmaster, there is actually a real tone difference, to be sure. The US model sounds like heaven – and the Squier is standing in line at the pearly gates on its way there. There is a whole range of Fender Squier Vintage Modified guitars and basses at zZounds. Other than the crazy-to-remove plastic pickguard plastic covering, my Jazzmaster is absolutely superbly made – more so than many MUCH more expensive guitars made by so many other brands. * The neck sits in the pocket quite nicely. * The finish on the neck is great. I can easily like gloss or satin necks: and this gloss neck feels like old school stuff right off the bat. * The pickups sound fantastic and are just fine like they are. Although some would still take them out and replace them, I’ve found them to have a great sound that kicks very consistently. * The paint finish is very nice. The sunburst-ing is nicely done, the coloring is good, and the finish is nice and even. * I think the soldering is reasonable for this price range instrument. The components are as expected for an Asian-made guitar, and attention to detail for soldering, placement, and wire lengths are just fine: again, far better than many guitars costing a great deal more. Fender understands this part really well and does a great job of it! 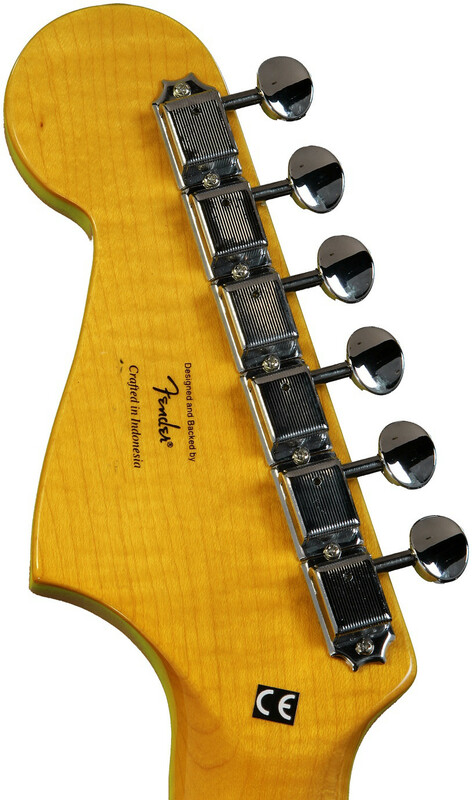 * I am a major fan of the Vintage style tuners used on many Fender and Squier necks. The tuners used on my Squier Jazzmaster are similar to, if not identical to, those on my Jimmie Vaughan Strat – they’re smooth and easy. * The nut is nicely cut and the strings are in good shape. * I think a little bit more time could have been spent on string height and intonation at the bridge: it wasn’t grossly set up, but it could have been just a little better – such that our beginner guitar friends would get much more playing enjoyment out of the box. The newest Squier 2014 models are now in stock at zZounds! As odd as this might seem for me to complain or remark, it was nearly impossible to get all the pickguard protective plastic removed. The material under the bridge and between the bridge and the bridge pickup is still there in little noisy crinkly shards. When I play the guitar I can hear and feel the little bits of plastic all under where the bridge and bridge pickup are. It makes me cringe to hear crackling while I’m playing, so I’m likely going to remove the strings, pop off the bridge, and maybe even pop up the pickguard just to get rid of the rest of the stuff… I’m very appreciative of getting to be the first person to scratch up (what my British friends would call) the scratchplate… But gosh – this is a real pain. I like the “coolness” of the clickety tone rings on my Squier Vintage Modified Jazzmaster Special, but it really gets irritating after a while. I’m not a purist, so I would not have missed the clickies at all if Fender had put in smooth-dialing concentric pots ;-). This entry was posted in Electric Reviews, Guitar Review and tagged 6-string, electric, fender, guitar, jazzmaster, review, single coils, squier, vivid peace by Jim of Vivid Peace. Bookmark the permalink.